Bohr was born on October 7, 1885, in Copenhagen, Denmark, to a family that inspired and encouraged his early interest in science. He received his doctorate from the University of Copenhagen in 1911 and spent a year in England with ERNEST RUTHERFORD and other leaders in theoretical physics working on the structure of the atom. Bohr developed a planetary model of the atom with electrons in stable orbits around the nucleus to explain why individual elements emit only certain frequencies of light (atomic spectra) when excited by high temperatures or electronic discharge. Bohr theorized that electrons emit or absorb radiation as they move from one energy level to another. In 1913 this work culminated in a mathematical description of atomic structure that revolutionized classical physics, incorporating both Rutherford’s ideas about the atom and MAX PLANCK’s quantum theory. 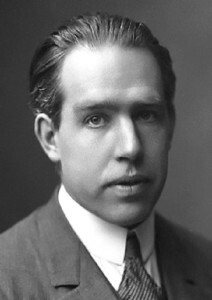 Bohr’s theory earned him the Nobel Prize for Physics in 1922. In 1920 Bohr was appointed director of the University of Copenhagen’s new Institute for Theoretical Physics. In 1927 he introduced the concept of complementarity, which includes the proposition that atomic phenomena are best described by calculating the probabilities of the various possible results of a given situation, a departure from linear “one­right­answer” thinking. In the 1930s Bohr developed the liquid­drop model, which proposed that the nucleus consists of neutrons and protons held together strongly, like molecules in a drop of liquid. His understanding of how a liquid drop ruptures enabled him to offer an accurate description of nuclear fission to ALBERT EINSTEIN immediately after LISE MEITNER and Otto Frisch, in 1939, verified that they had split a uranium nucleus. Bohr, whose mother was Jewish, escaped German­occupied Denmark via Sweden and traveled to the United States in 1943 but only after King Gustav of Sweden promised to grant refuge to Denmark’s Jews. In the United States, he joined the Manhattan Project, the government program to develop the atomic bomb. After World War II, Bohr passionately advocated an international open exchange of information regarding nuclear weapons research; he believed this would reduce the possibility of nuclear war. In 1955 Bohr helped organize the first Atoms For Peace conference in Geneva, Switzerland. Bohr continued as head of the Institute for Theoretical Physics in Denmark until his death on November 18, 1962, in Copenhagen. Bohr’s theoretical insight was integral to the development of atomic and nuclear physics during the first half of the twentieth century. Bohr’s theory of atomic structure continues to serve as the foundation for our modern understanding of the structure of atoms. Bohr’s contemporaries built upon his model of atomic structure and multiple attempts to use the model to explain atomic behavior proved successful. Bohr’s model was later modified several rimes, but his basic ideas were the foundation for decades of atomic research. Bohr’s complementarity principle was the first systematic formulation of quantum mechanics, an area of physics that seeks to explain the dynamic systems of subatomic par­tides (electrons, neutrons, protons, etc.). This formulation, known as the Copenhagen Interpretation because it originated with Bohr and his colleagues at the Institute for Theoretical Physics in Copenhagen, has been described as a revolution in scientific thought. It forced physicists to recognize that, at the atomic level, exact laws of causality do not exist. Furthermore, it is impossible to observe atomic behavior without influencing it and without deciding what data to include and what to ignore. In other words, there may be more than one way to conceptualize nature, and when scientists cannot observe phenomena without influencing outcomes, exact cause­effect relationships do not apply. Bohr’s legacy also includes his humanitarian efforts to help save Danish Jews, his advocacy of peace in the Atomic Age, and the encouragement of his son, Aage Bohr, who earned the Nobel Prize for Physics in 1975. Posted on March 5, 2015 by Natalie. This entry was posted in Scientists. Bookmark the permalink.